Summer: maybe you are somewhere exotic, relaxing on the beach, discovering a new country, shopping abroad for your new home. What you want is to take home this relaxed feeling, you want it to be summer all year long. This makes me think of my trip to Venice last April, a nice long relaxing weekend before I was going to rush around Milano for the furniture fair. I visited Venice already few times, is always great to just wander around and discover new things. This time I wanted to have a combination of the "real" Venice and some modern art. So I went to visit different modern art exhibitions, one of them was the Henri Rousseau exhibition which just opened. I must say I was never a fan of Rousseau but as it was in Palazzo Ducale, which for one or another reason, I never visited, I thought why not take a look. It was perfect, and I discovered some amazing paintings. They seem quite flat when you see them printed, but once you see them in real and close by you discover a depth. All those green tones, details...... an inspiring exhibition. In my first blog post I told you I would write about how a painting, a movie, a city,...... can inspire you for decorating your home. So lets take a look how we can get inspired by a painting of Rousseau. Bringing a bit of summer in your home. It can be tempting to redecorate your home after a wonderful summer holiday, you feel inspired by the things you've seen, the hotel you stayed. So lets take a look how we can add a bit of exotic touch to your home, without changing everything. You don't want to feel in a few months that this summer feeling is maybe a bit to much during winter. But a touch of green will give you the impression that nature is coming into your house. So lets think of creating a kind of winter garden, a nice corner or a complet room where you can relax, read a book, listen to music. 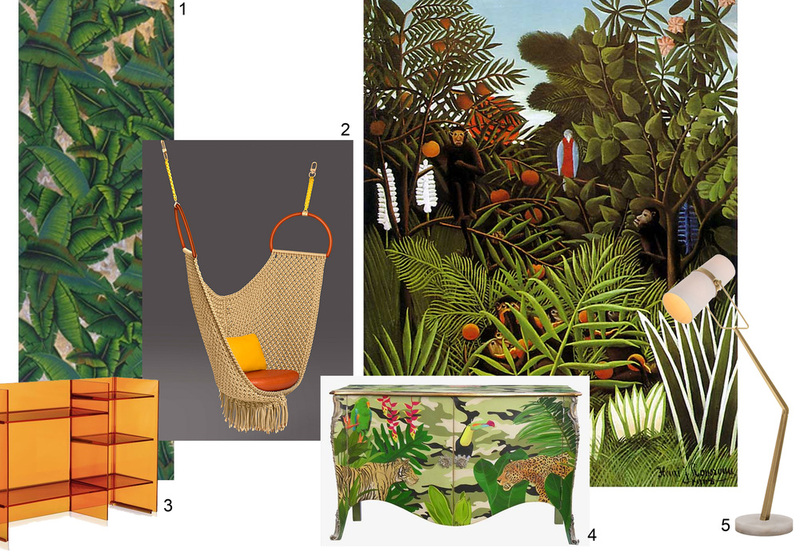 When we see the jungle paintings of Rousseau we get immediately the desire of adding some green leaves on the wall. De Gournay has some beautiful hand painted wallpapers. The green is a bit to strong for you? Don't worry, every of their designs can come custom made, so you can have the option of having the exact green you desire. And than I can imagine myself very well dreaming away in the Swing Chair, designed by Patricia Urquiola, for the Objets Nomades collection of Louis Vuitton. This is also a piece which will fit perfectly the 70s trend for this winter. More about that in future blog post. I saw the painted buffet of Moissonnier the first time last year during the Maison & Objet fair, it is an amazing piece which will find its place in a contemporary setting, or can give a glamorous touch to a classical room. And why not combining this luxurious hand painted wallpaper, furniture with some transparent plastic? I just loved the sunny orange shade of the Kartell shelves, being transparent makes it also "less" important, it will blend away with the background, it will be a discrete base to put your precious objects, to keep your pile of "to read" books. And don't forget to look for a standing lamp, the one I found here form Arteriors Home has something very graphical, almost coming out of a cartoon, fitting perfectly the theme. Cocktail time. I feel as I enter an American movie of the 50s: where they have those cocktail parties, everybody well dressed, a bit of glamour. We are all the time meeting friends somewhere in town, wouldn't it be nice to have them over at your place, you can play the right music, the cocktails will be made with lots of style by you..... yes, you see..... you can imagine yourself as the perfect host, exactly as we know them from the movies. This Climbing Leopard rug of the Rugcompany will make a great center piece. The rug is designed by Diana von Furstenberg, animal inspiration is a classical theme for her, she brings a bit of drama with it in the room. Or on the evenings when you come home after a long day in the office and want just to enjoy a small aperitivo, before starting to cook, feeling special in the Butterfly Chair of McGuire, I think is an amazing piece, also quite 70s inspired.... there must be something in the air.... you can have it finished with gold or silver leaves. I think you deserve that. And what do you think of the bar cart? I was looking for a piece, in a way discrete, as it has to keep your glasses, bottles but than I found this yellow antique one designed by Aldo Tura, who started manufacturing furniture in the 30s. The yellow will bring the sun in your home even on a grey winter day.The small side table, designed by Sebastian Herkner for ClassiCon, has a hand blown glass base and a brass top, perfect to keep your glass close by. You can can come back home and take a good look at the living room, it needs a re-look? You want to add some color? Green is a good base, everything works with green. Not sure? Take a look at the flower shop next time you pass by. So lets take a look how we can get nature inside the living room. You really love the hand painted wallpaper I was taking about earlier but is a bit to expensive for the budget? You can find more companies bringing this type of design, one of them is Pierre Frey, they have this design also with a white background and in softer green tones. The rug, made by the Argentine wool rug artist Alexandra Kehayoglou, is a piece of art. She makes all the different round shapes in different tones of green, different heights and assembles them at the end. Could be a good idea to hang it on the wall and enjoy it as a painting. Adding a Guernica armchair, designed by Laura Kirar for McGuire is making a clear statement: it has an undeniable presence and energy, it is a piece you can't ignore when entering the room. The armchair has something very easy going, effortless but you should know that it takes several weeks to complete one. The small side table, Lion Stand of Baker is in perfect company in the jungle inspired room, it can also be used as a small stool in case everybody wants to come and visit you now that your home has this positive vibe. And than we should think of the lights, they should be interesting in shape, material but also in the way they illuminate the room. The Blom lamp of Fontana Arte is fitting perfect that requirement. It is taking up very little place, and you can adjust the light by turning the petals around. Another lamp which will create a great ambiance is the Discoco hanging lamp of Marset, designed by Christophe Mathieu. The lamp provides direct downward illumination along with a dramatic play of lights and soft shadows. Even turned off it will retains its attractive presence. Some botanical prints, animal drawings, and butterflies will finish the decoration of the room. I found this antique illustration of a colorful tropical toucan bird on Etsy, at The Black Vinyl shop. And maybe you are just at the start of decorating your new home, in that case you can even think of the bathroom, make it different, lets get inspired by one of the softer painting of Rousseau. These days we see a lot of the concrete tiles used again in bathrooms and kitchens, but they don't have to be the traditional ones as we all know them, see the tiles here of Contemporary Tiles, they look as abstract leaves, and green is a perfect color for a bathroom. This is the first room you enter in the morning, imagine it will be as entering a garden. And a feminine touch? Some soft pink? In combination with green it gets even a poetic touch. Check once the sanitary objects of Ceraminca Flaminia, they also have other soft paste tones if pink would not be your color. And to continue the poetic mood I would go for the hanging lamp of Tord Boontjes for Porta Romana, it is as if you would enter a dream scenery. And why not change the chrome faucets for ones finished in white from Zucchetti? Looks great, no. The Thinking Man's Chair of Jasper Morrison is for me the perfect match when you want to take a seat and enjoy the bathroom while reflecting on the day to come. The chair was designed in 1986 and produced by Cappellini, already a "classical" design piece. Interesting to know: Henri Rousseau never traveled outside of Europe, he only knew the jungle and the animals of drawings. So you see, it is enough to dream.